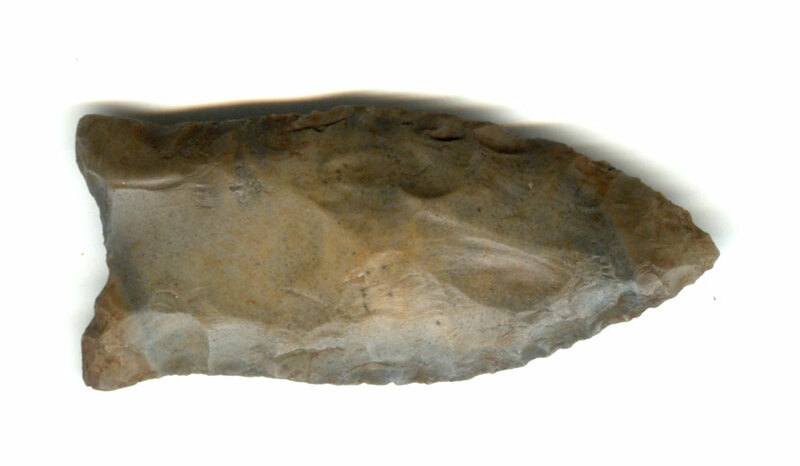 A Medium Size, Heavily Patinated, Visibly Aged And Anciently Use Sharpened, Well Made Hazel Style Clovis Point That Exhibits Stone Coloration Aging And Heavy Surface Patination, Correct Basal Fluting And Fishtail Style Base, Correct Aged Blade Sharpening Use Reduction, Correct Rolled Basal Stem Edge Hafting Dulling, Aged Surface Deposits, Correct Early Style Blade Flaking, Correct Material And Manufacture For The Area Found. Ex-Roy Morley Collection. This Type Is Very Similar To The Ross County Clovis Only Having A Longer Waist. This Nice, Rare Example, Displays Excellent Workmanship! Includes A Ken Partain And T & T Archaeological ( Tony Putty ) Certificates Of Authenticity!